Strickland had 14 saves for the Giants last season. Jerry Dipoto wouldn’t officially announce the signing, but the Mariners’ general manager did confirm that it was going to happen. Just minutes before he was set to take the dais at the Mariners’ annual pre-spring training luncheon on Thursday morning to speak to the local media, Ken Rosenthal of The Athletic tweeted that Seattle had reached an agreement with free agent reliever Hunter Strickland on a one-year contract. However, Major League Baseball sources confirmed the report that the Mariners and Strickland were in agreement on a one-year contract. Strickland is in Seattle and has to take and pass his physical before the deal can be finalized. Manager Scott Servais also mentioned the Strickland signing in an interview with ESPN 710. While he couldn’t speak in specifics, Dipoto did expound a little on the thinking behind the looming deal. Unlike most typical free agents, the Mariners will have club control over Strickland through the 2021 season. 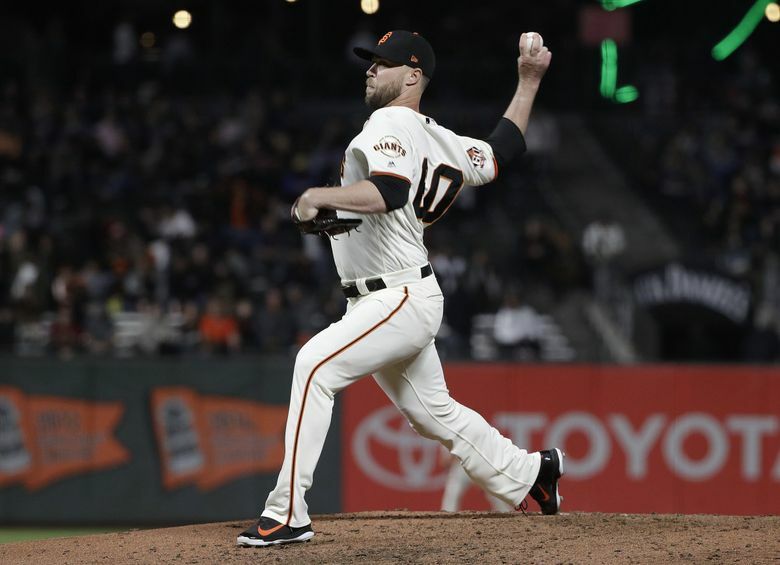 The Giants decided to designate him for assignment in November just before the non-tender deadline after a tumultuous 2018 season where he posted a 3-5 record with a 3.97 ERA and 14 saves in 49 appearances. His season was interrupted on June 20 when he suffered a broken right hand after punching a door in a fit of rage following a poor outing and a blown save. Strickland missed two months with the injury and admitted he was looking into anger management counseling. Besides the injury, Strickland saw his ERA climb to a career high while his strikeout percentage (18.4) and strikeout to walk ratio (1.67) dropped to career lows. In 2017, Strickland became infamous for starting a bench-clearing brawl with Bryce Harper after hitting with a pitch in retaliation for a pair of homers that Harper hit off him in the 2014 playoffs. In that fight, former Mariner Michael Morse suffered a concussion and never played again. Strickland is still likely to be the top candidate to fill the closer role for a bullpen that Dipoto has admitted will be the biggest question mark going into the season.